Welcome to the Jan/Feb 2014 edition of Vanessa Collins Online magazine. This Christian based publication is packed with articles that are truly inspirational, motivational and educational. We cover everything from praising God to how to save at the grocery store. We feature veteran writers as well as some new and upcoming talent. 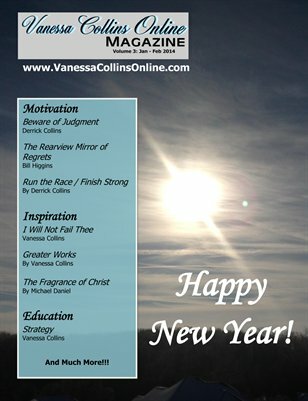 This edition includes: Beware of Judgment (Derrick Collins), The Rearview Mirror of Regrets (Bill Higgins), Run the Race / Finish Strong (Derrick Collins), I Will Not Fail Thee (Vanessa Collins), Greater Works (Vanessa Collins), The Fragrance of Christ (Michael Daniel), Strategy (Vanessa Collins) and much more.